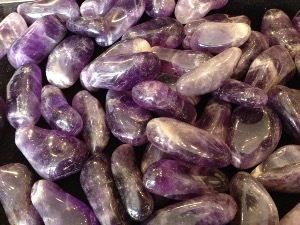 Amethyst is a violet coloured variety of quartz and is often used in such things as jewellery. It can be found in a wide range of countries though most commonly from Brazil & Uruguay. It’s a semiprecious stone and is the traditional birthstone for February. Amethyst is said to be the stone of spirituality and contentment. It may provide the feeling of common sense and encourage flexibility in decisions. It controls temperament by imparting a soothing, calming, and tranquillising influence, while clearing away unproductive and unkind vibrations. It has, since historic times been used to encourage and support sobriety. It is said to be an excellent stone for one who is attempting to find freedom from addictive personalities. It’s also said to used in the treatment of hearing disorders, to both strengthen the skeletal system and reinforce ones posture, and to simulate both the sympathetic nervous system and the endocrine glands to proper and precise performance. It’s is said to be quite useful in the treatment of disorders of the nervous system, digestive tract, heart, stomach, skin and teeth. It can may help cellular disorders to re-adjust and re-align in order to eliminate distressful conditions. It’s also said to help the treatment of insomnia and to ameliorate pain from headaches and other disorders and may be as an elixir in the treatment of arthritis. Amethyst Brazilian tumbled to a smooth finish. Tumble Stones can also be placed around the home for their energies or can just be nice decorative items. 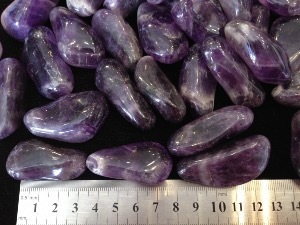 Amethyst crystal gemstones of varying sizes selected specially for your order.